Two years ago, on March, 13 in Donetsk there was the significant for many townspeople meeting of supporters of a unified Ukraine. It was not the first nor the last meeting on the eve of the war in the Donbas. But at that time not only blood was shed for freedom of Donetsk, but there was the first death. During the massacre, one of the participants in self-defense militia, a member of the Donetsk cell of "Svoboda" Ukrainian Nationalist Political Party Dmitry Cherniavsky was mortally wounded. Two years later in Kiev, natives of Donbas, IDPs and members of volunteer battalions have come together on the Maidan to commemorate the sworn brothers lost at war, and remind once again everyone that "Donbas is Ukraine". 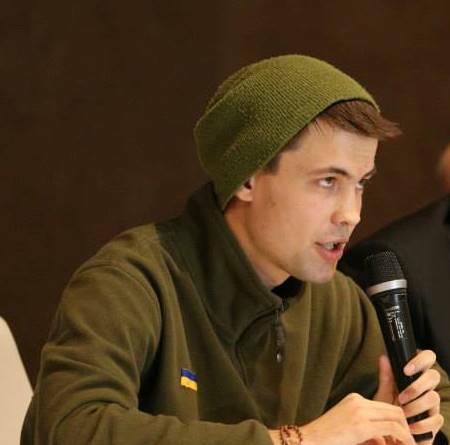 Vitaly Ovcharenko joined the self-defense directly during the meeting. 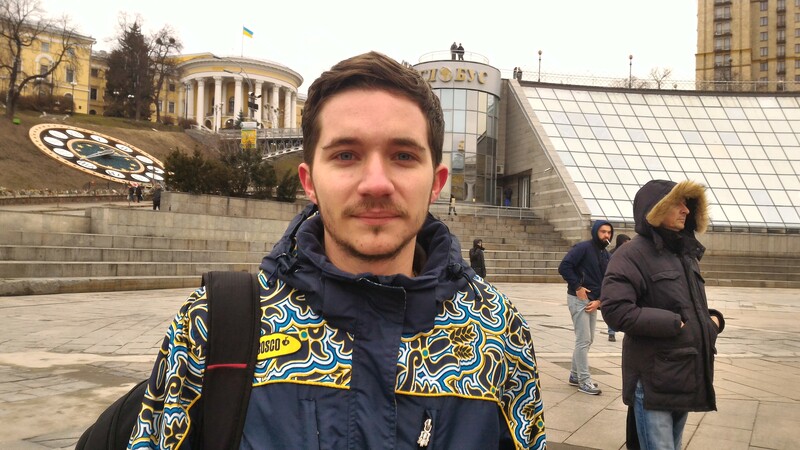 Later he became a volunteer of a battalion "Artemovsk"
Before the meeting I have seen my friends near the scene. Guys bonded red tape to their sleeves; they warned me to be careful, and said that they would go to help the protesters. Police were sufficient to prevent those beatings, but the pro-Russian "titushky" attacked with such hatred, their crowd was, so to speak, "hopped up" to a maximum. I think that on that evening the police were allowed to stay idle. A normal man, even without an order, when seeing as they beat women, children, the olds, should try to protect them at least. Moreover, if he a police officer, especially having weapons. But Donetsk police did nothing. We were going to protect activists. We are prepared in advance. We had gas cans which can be purchased in any special shop. We had special metal " angle bars" on our elbows to protect them against hits of bludgeons. But they did not help. We did not expect that such a massacre will start. Semenchenko said that the police is on our side and will not tolerate unrest. But it turned out that the police was against us and initially has organized it all. Semenchenko first ran away from there. We did not see him later. However, we have fulfilled our task. Protesters were gone, and we have faced the attack of "orcs". 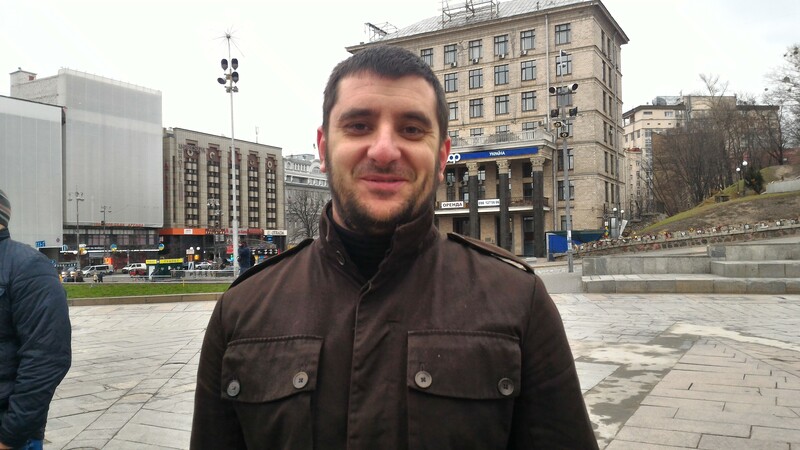 Oleg Sahakyan, a public figure from Donbas, one of the organizers of the meeting "Donetsk is Ukraine"
For me, there are two important dates: when the Donetsk Euromaidan has took place: people stood up for European integration, for human rights, for European law. And this unfortunately did not have a strong enough response in Donetsk. But when there was a question to protect the Ukrainian land, the Ukrainian statehood, the people began to get out for actions. These were the actions under the slogan "Donetsk is Ukraine". The issue of European integration was no longer on the agenda. It was only one question to protect our homeland. And here I see two significant dates. First is March, 4 when Donetsk admitted to itself that it is Ukraine. People came to the action but stood separately, in groups of 3-4 people. And only when they have noticed that their neighbors and acquaintances came together with them to the actions, people rallied. Within 15 minutes in the center of Donetsk near the Cathedral several thousand people had accumulated. They admitted themselves that Ukraine and Ukrainians does not mean only to wear cossack trousers. The second significant date for me is March, 13. At the day, according to some sources, there were five deaths, and according to other sources - three. The news of the death of Dima Cherniavsky quickly spread throughout Ukraine. All in Donetsk understood at that time that Russian tanks were already at the actual border with Ukraine. Hybrid aggression went already at full speed. We knew that against us on the other side of the square there are lumpens, criminals, and Russian "tourists". March, 13 is a turning point. After this date Donetsk plunged into the quagmire of terror. Then people have understood that can pay for their civil position. Up until April 28, when a peaceful march was driven off, Donetsk came out to actions dozens of times. Today during the action we honor the memory of those who sacrificed their lives protecting us on the eastern borders. These were the people thanks to whom it becomes possible that the delimitation line is where it is today, and not, for example, on the Dnieper, or not at the slopes of the Carpathians. But such risks were. Russia wages war not for land, and for the destruction of Ukrainian statehood. The idea of the Ukrainian state itself. We have no right to forget about it. - Did you contact law enforcement agencies before those meetings? They promised us to provide more than 1.5 thousand policemen. Mounted police was promised and also promised in case of the use of force, no matter which side will start, that the police will use force to suppress possible centers of provocation. But, in fact, the police protected rather militants than us. At the moment when it should show its toughness, the police made possible to start the bloodshed. However, it was very significant that the police stood back to us without guarding against, and turning shields to the militants. And it was very indicative. When from our side the line was held only by the activists and we specially created buffer zone, and the police on the other side stood the shields to the militants, and they were not afraid to stand with their backs to the pro-Ukrainian action. And this is the end of the meeting.